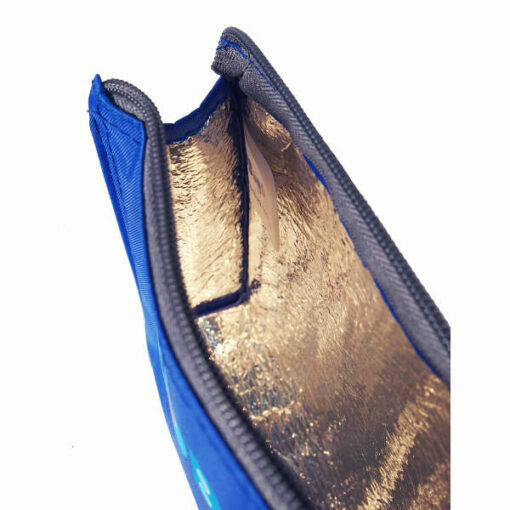 MedBag’s pouch for holding EPIPEN® auto-injectors is a light foil lined allergy bag designed specifically to hold medication. MedBag’s EpiPen pouch holders are a foil lined bag designed specifically to hold a range of medications. Its bright design makes it highly visible and easy to use. 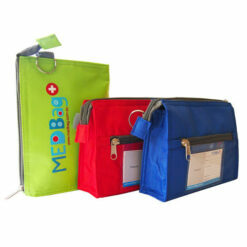 These bags help protect adrenaline from temperature fluctuations. They have one main compartment for storing bigger medications and a zipped pocket on the back for other necessities. There’s a key ring on the side for attaching it to a bag. 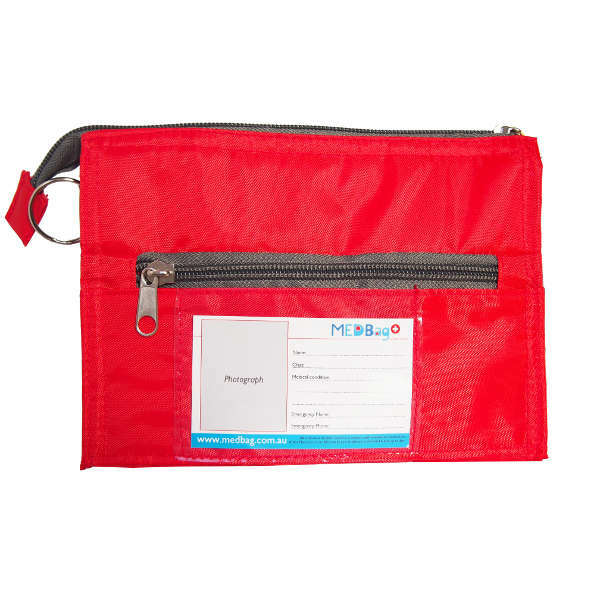 The front of the pouch has MedBag written in large font and has a red Medical Cross to identify it as important. The back of the pouch has a clear plastic pocket with an ID card that you fill in with your child’s name, medical condition and emergency contact info. There is also a space for a photo for easy identification of who the medications belong to at a school or daycare facility. Bright design for high visibility. 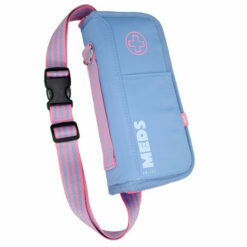 Holds EPIPEN®, Anapen®, Emerade® and Jext® adrenaline auto-injectors, inhalers and other medications. Extra zipped pocket at the back. ID card on back for identification and emergency contact information. Size: approximately 200mm (W) x 140mm (H) x 55mm (D) (depth is tapered, 55mm is the widest point). I wasn’t so keen with this bag and I have now replaced it with something much better. This bag has plenty of room so can fit far more than an epipen or two. It is lined with a foil material but the zip does not seal the bag so I think that is probably a bit pointless. This bag is fine to put into a handbag but to carry it by itself is not so good, the tag on it came loose very quickly and so became unusable after only a few uses. I think there are much better bags out there, I bought another from here that is brilliant, I can’t remember the name but it has handles and is far better in many ways. Hi Becca, I’m sorry to hear that you are not completely happy with your bag. If you send a photo of the broken tag to us here at customercare@allergylifestyle.com, I will pass it on to the manufacturer to see what we can do for you. Apologies again, I hope we can get this sorted out for you quickly. Very convenient, perfect fit for all medications required while on the go! 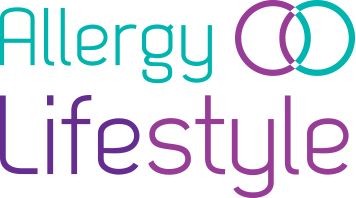 Excellent service from allergy lifestyle too!! Very handy. Fits our girl’s epipen, liquid antihistamine bottle and her inhaler. The zipper seems to be good quality. The built In id-label is a great bonus! Yes am delighted too to get something which is right size for 2 epipens and zirtek. Nice bag to hand to the school, also labelled, very important. We left our old bag behind in a cafe and unfortunately didn’t have epipens labelled with name and number. Got them back in the end but this bag has it built in just makes it all easier. Very compact. Fits 2 pens and zirtek. Good for school. Bright colours easy to identify. I added a shoulder strap so it would be easy to grab if kids leaving school on nature trails etc. would be handy if this came as standard. Compact light bag, fits two pens and bottle of medicine. Handy for school/creche to keep all their medicine together in a marked bag with their photo.